Rome is one of the most exciting and fascinating cities on earth. It can also be exhausting and daunting, with frenetic traffic and simply so much to see and do. We have designed this tour for those looking for a relaxing and luxurious, hassle free break taking in fabulous wines, gourmet dining and of course Rome’s architecture and antiquities. Food and wine are the protagonists this trip, and you will enjoy an array of experiences from tasting traditional Roman Jewish style artichokes in the charming Ghetto to a tasting menu extravaganza at an unforgettable 3 Michelin starred eatery, to a private wine tasting overlooking the Spanish Steps. From the moment you arrive at the moment you depart, you will be effortlessly chauffeured and showed around Rome, taken to amazing restaurants, and privy to many much loved and secret corners of this stunning city. Gourmets and foodies will love Rome with its colorful markets, picturesque shops, and its traditional cuisine. Wonderful local dishes include Spaghetti Cacio e Pepe (simple and scrumptious pasta with cured Pecorino cheese and freshly ground black pepper), Bucatini all’amatriciana (gorgeous pasta with “guanciale”, tomatoes and garlic), Spaghetti Alla Carbonara (famous Roman pasta dish with comforting bacon, eggs, Pecorino and Parmigiano) and Abacchio Alla Romana (lamb cooked with rosemary, sage and cloves). 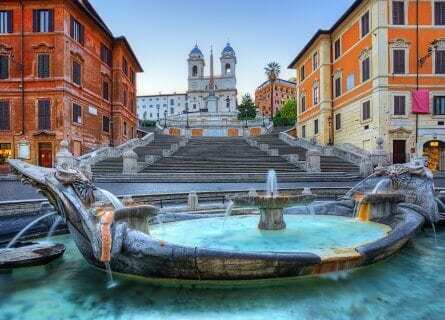 On this tour you will visit Rome’s loveliest quarters and areas around the Campo dei Fiori, the Ghetto, Trastevere, and with your own private guide you will discover little gems such as La Dolce Roma in the beautiful Via Della Portico d´Ottavia (a famed patisserie), Sant ´ Eustachio (coffee heaven), San Crispino (best gelato in town) and the outstanding Enoteca Trimani (beautiful wine merchant dating back to the early 1800’s). 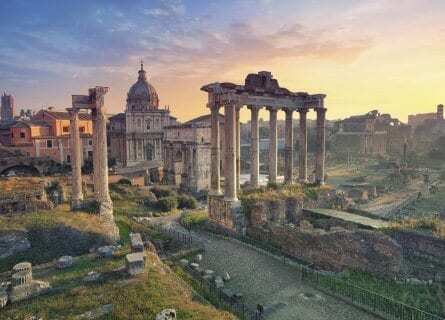 Along the way, you will take in some of Rome’s most beautiful sights such as the 12th century gold mosaics of Santa Maria in Trastevere to the Piazza Navona with Bernini’s beautiful Fontana dei Quattro Fiumi (Fountain of four rivers, namely the Danube, Ganges, Rio de la Plata and the Nile) and Hadrian’s Pantheon with its charming piazza. You will walk through the breathtaking Forum, see Obelisks, visit neat Gardens, and promenade through pretty squares lined with darling cafes, all with your own guide. If you have little time and truly want to see and taste the best of Rome, contact us for more information on this tour. Once you arrive at Rome’s airport, your private chauffeured Mercedes will be waiting to sweep you away on this fantastic tour. Head into central Rome to your boutique hotel, owned by the Ferragamo fashion family. You will find a bottle of fine Italian wine in your welcome pack, as well as a bound keepsake itinerary with information on Rome, Italian food and wine, and shopping and dining tips. The afternoon today is free and we suggest you visit the nearby Piazza di Spagna, perhaps having something sweet at the beautiful Babington’s English Tea Room. Your hotel is right off the elegantissimo Via Condotti, where Rome’s best clothing shops are located. Head up the Via Babuino (one of our favorite streets in Rome) towards the Piazza Popolo (home to some beautiful Caravaggio’s, in the Santa Maria del Popolo church) and enjoy the art galleries and cafes en route. You could finish the afternoon with a relaxing walk through the Villa Borghese. At your leisure, return to your hotel. In the evening, your personal chauffeur will pick you up to take you to your welcome dinner tonight, at Rome’s finest restaurant, complete with three Michelin stars. Bavarian Heinz Beck is one of the world’s most famous chefs and you will enjoy a tasting menu of his superbly executed Mediterranean creations. The atmosphere is refined without being stuffy and the panoramic views over Saint Peter’s are utterly romantic. When your meal concludes, your driver will take you back to your luxurious hotel, buona notte! Enjoy a free morning to relax, sleep in, do some sightseeing or shopping, or just linger on your wonderful rooftop bar overlooking Rome. At lunchtime, your private guide will pick you up you will take a quick taxi down to Trastevere. Lunch will be at a charming trattoria in bohemian Trastevere and you will enjoy traditional dishes such as “Carciofi Alla Romana” (Roman style artichokes) and homemade pasta. You will taste some excellent Southern Italian wines such as Aglianico from Campania. After lunch explore Trastevere with its narrow cobblestoned streets and “piazzette” (tiny squares). There are many little gourmet gems in this neighborhood, from cheese shops to markets (such as the colorful mercato in Piazza San Cosimato) to historic wine shops. The Basilica of Santa Maria in Trastevere is one of the oldest and most beautiful churches in Rome and you will enjoy an explanation of the history behind it. 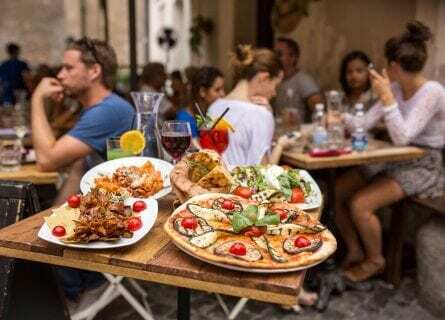 From Trastevere, you will cross the Tiber River on a picturesque bridge and head into the Ghetto where you will still see many historic kosher restaurants and bakeries. Your guide will tell you all about the quarter’s legends and history. Next stop is the Pantheon where before your visit, you will enjoy a coffee or aperitif in the piazza. Your guide will walk you back to your hotel, stopping en route at the Piazza Navona to admire Bernini and his archrival Borromini’s masterpieces. Hope you had a great day! Free evening in Rome with our suggestions for dinner and entertainment. After breakfast, your personal art guide will come to pick you up and this morning you will explore Rome’s most prized possessions- the Forum, Capitoline Hill, and the one and only Colosseum. Wear comfortable shoes today and get ready to work off some of those dishes from your welcome dinner! From your hotel near Piazza Spagna, you will head south winding your way through narrow streets running parallel to the bustling Via Corso until you reach the darling Monti quarter. Just beyond lies the ancient Coliseum, dating back to 70AD! This is one of the greatest achievements of Ancient Roman architecture and engineering. You will learn all about the Colosseum’s colorful past from when they used to hold mock sea battles to the more famous gladiator games. Continue on to the Foro Romano and breathe in the history. Walk up the steps to the Campidoglio, where the town hall and the wonderful Capitoline museums are located. From here you also have fantastic views. Enjoy a guided tour of the Musei Capitolini, located in 3 palazzos. Lunch will be on your own with our suggestions, based on your preference (seafood, high end, local and charming). The rest of the afternoon is at your leisure. 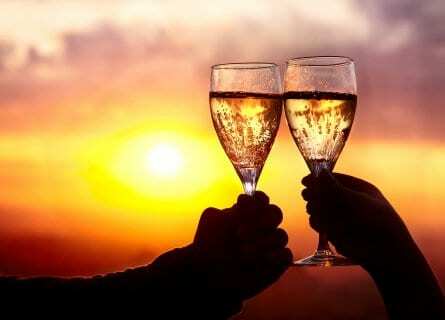 This evening, you will enjoy a spectacular wine tasting experience in Rome. Carry on to a simply unforgettable private wine tasting (just for you, and in English of course) with a charming host at Rome’s mythical Roscioli, and conclude with a lovely dinner paired with top Italian wines. This will be a highlight of the stay! This morning, at your preferred time, your chauffeured Mercedes will arrive to take you back to the airport. Depending on the time of departure, we can make suggestions and suggest other activities in Rome such as private cooking classes and more. Drop off at airport. Arrivederci! Now home with lots of great memories. Wine tasting, ancient Rome, Vatican and Pompeii tours were all excellent. Impressed with the depth of knowledge of all tour guides, as well as being very personable. Everyone was prompt, all the cars were clean, drivers friendly etc. As mentioned in a prior email, would certainly recommend to anyone. The keepsakes were much appreciated and enjoyed. Thanks again for a well organized and executed tour program!